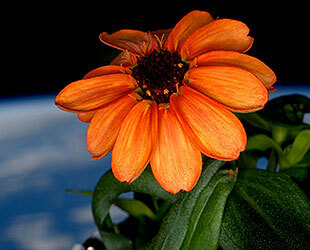 — "First ever flower grown in space makes its debut!" 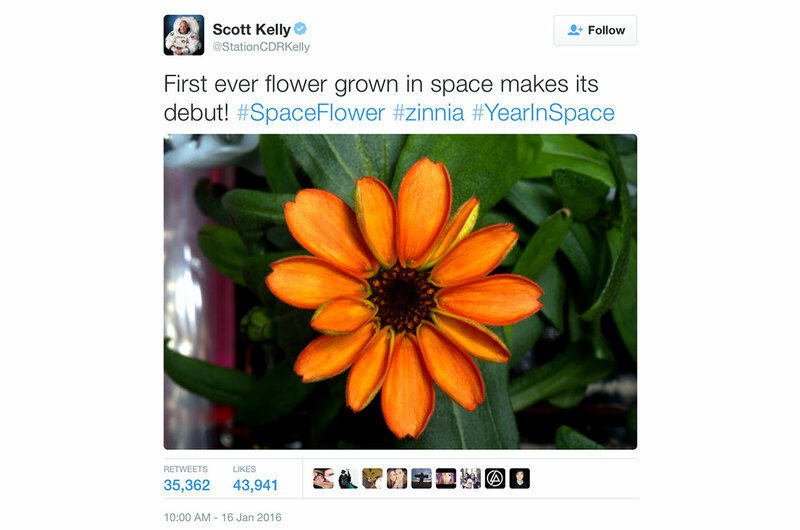 With that declaration, NASA astronaut Scott Kelly revealed to the world the bright orange zinnias that had blossomed on board the International Space Station on Jan. 16. "Yes, there are other life forms in space!" he exclaimed on Twitter from 250 miles (400 km) above the Earth. He even coined a hashtag: #spaceflower. Kelly, the space station's commander, had good reason to crow. Just a few weeks earlier, the zinnias, which are part of the NASA plant growth experiment "Veggie," had come close to dying due to a break out of mold. If it was not for a revised care plan by NASA botanists on the ground — and Kelly's own "green thumb" on orbit — there may not have been any flowers to tweet about. But in conveying his excitement, Kelly made a mistake. 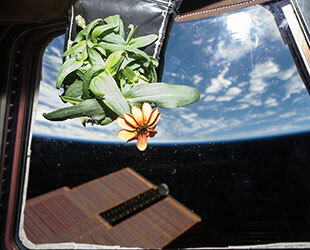 His newly-bloomed zinnias were not the first flowers grown in space. 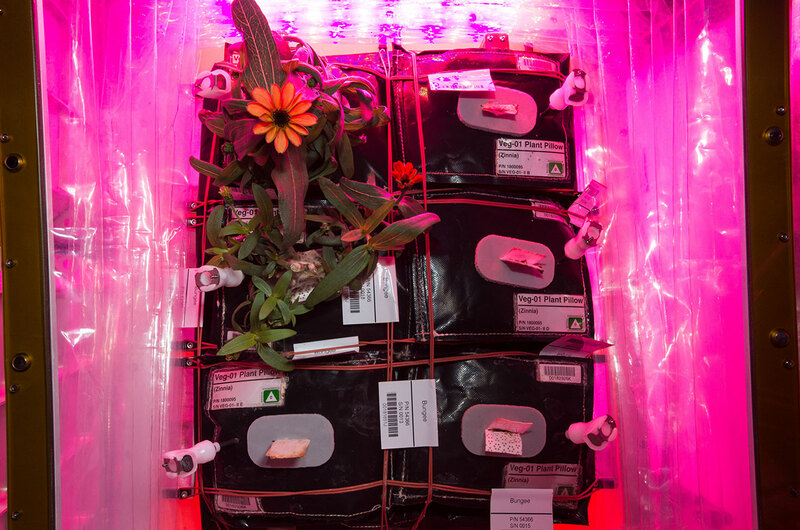 Four years ago, astronaut Don Pettit took it upon himself to grow a few different types of plants on board the station in what NASA labeled as a "personal biology experiment." Lacking the sophisticated growth chamber that would later launch as part of the Veggie study, Pettit used plastic bags as his pots. In addition to growing zucchini and broccoli sprouts, Pettit also successfully cultivated a sunflower to blossom — and beyond. "Sunflower is going to seed!" Pettit wrote in his blog, "Diary of a Space Zucchini," in June 2012. 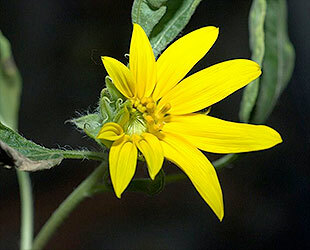 "His blossom is wilted-brown and has a few lopsided packed seeds. This is not quite normal, but then we are living on a frontier and things are different here." 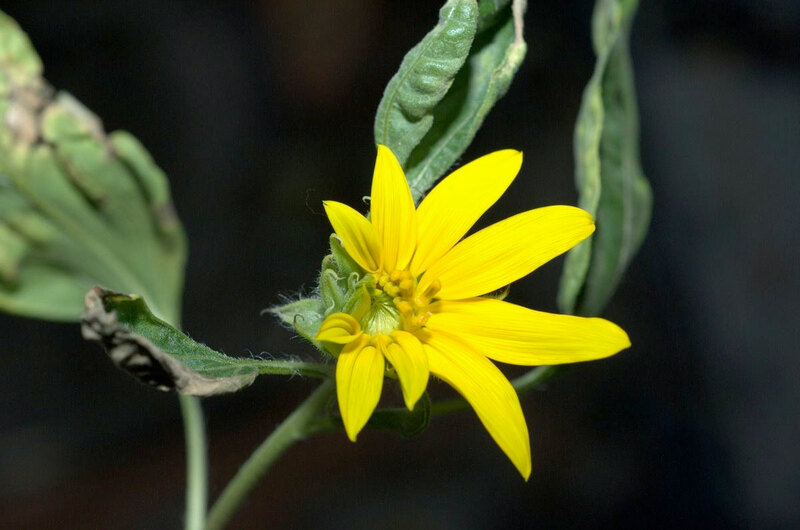 Pettit's sunflower, with its bright yellow petals (before they wilted), was the first flower grown aboard the International Space Station. It was not however, the first flower grown in space. Prior to the space station, NASA's space shuttle missions were just too short to grow flowers from seeds, but in the 1990s, cosmonauts grew dwarf wheat stalks through their full lifecycle — including flowering — on Russia's space station Mir. Before that, Soviet cosmonauts attempted to use a small greenhouse to cultivate orchids on the Salyut 6 station, but only those plants that were already budding when they were delivered to the outpost ever did bloom. Surprisingly enough, the Guinness Book of World Records includes an entry for the "first species of plant to flower in space." "In 1982, the then Soviet Union's Salyut 7 space station crew grew some Arabidopsis on board," the record reads. 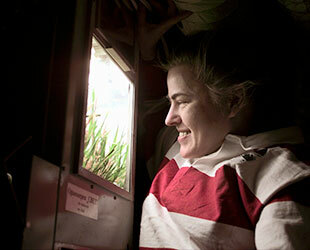 "During their 40-day lifecycle, they became the first plants to flower and produce seeds in the zero gravity of space." But even that may not be quite right — by a difference of more than a decade and a half. In 1966, the Soviet biosciences space probe Cosmos 110 launched with two dogs (named Veterok and Ugolyok) and several species of plants on a 22-day uncrewed mission. "Seeds had been moisturized on entry to orbit... but haricot beans germinated poorly," authors Brian Harvey and Olga Zakutnyaya described in their 2011 book, "Russian Space Probes: Scientific Discoveries and Future Missions" (2011, Springer). "Those that did grow developed sooner, faster and flowered twice more than controls." 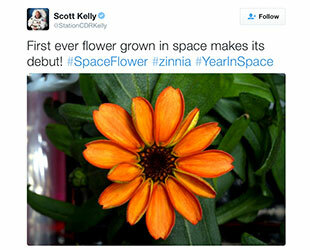 So Kelly's zinnia wasn't the first flower grown in space, but it may still lead to future firsts for space-grown plants. 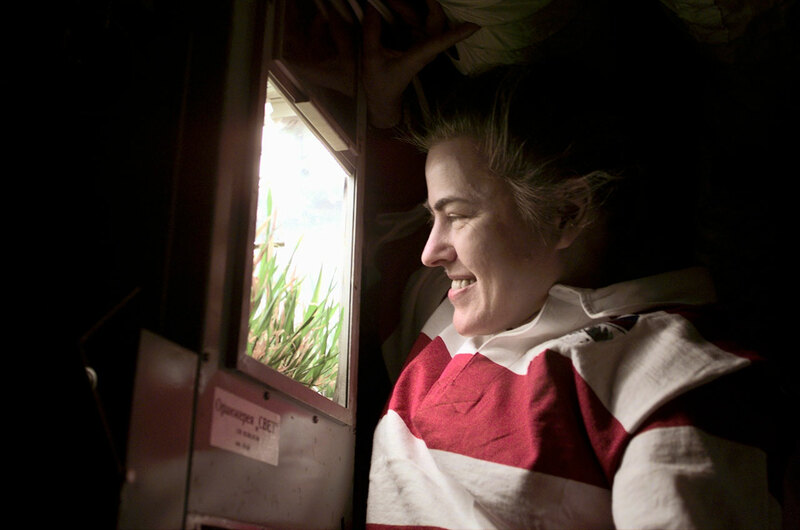 The Veggie chamber, which was first used to grow lettuce, was developed to test food production in space. Kelly and his station crew mates snacked on the red romaine lettuce they grew. 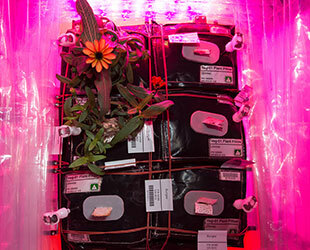 Ultimately NASA is hoping that astronauts can supplement their menus with freshly-grown greens, especially on future deep space missions to destinations beyond the Earth, like Mars. Growing plants also offer psychological benefits, as well as can assist in atmosphere recycling. "The farther and longer that humans go away from Earth, the greater the need to be able to grow plants," said Gioia Massa, science lead for Veggie at NASA. "I think that plant systems will become important components of any long-duration exploration scenario." 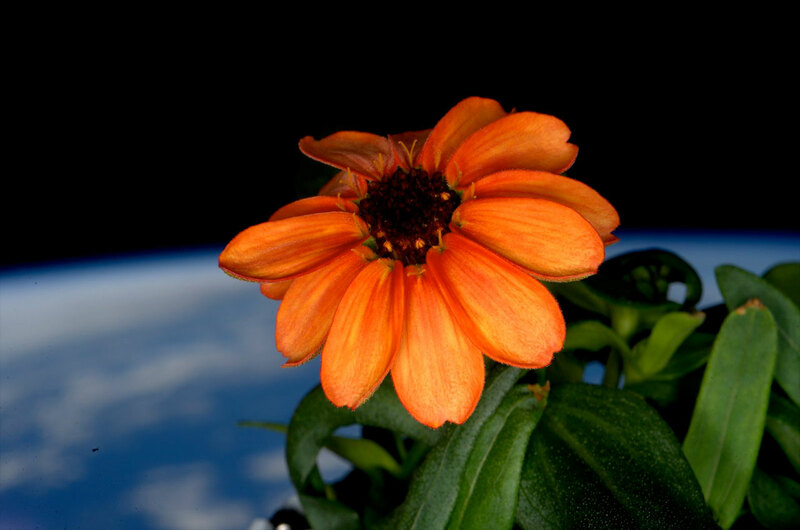 The zinnias, which are in fact edible (but were not eaten), were intended by NASA as a test run for growing tomato plants on the space station in 2017. By then, Kelly will be long back home on the Earth. He and cosmonaut Mikhail Kornienko are set to complete a nearly yearlong stay on the station in March. As such, the zinnia flowers and previous lettuce offered more than sustenance for the stomach, but satisfaction for the mind. "#SpaceFlower out in the sun for the first time!" exclaimed Kelly on Twitter. 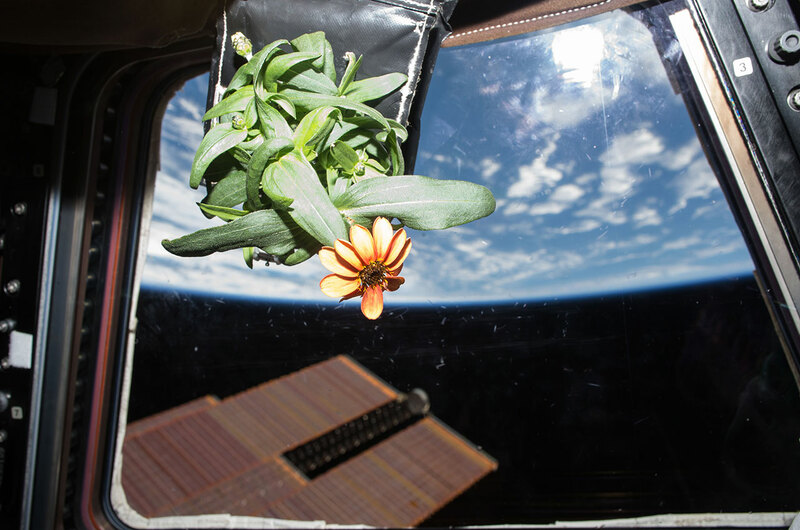 The photo attached to his tweet displayed the orange flower floating in front of a window with a view of the blue Earth below.